Grown up luggage feels like something that should be under my belt by this stage of my life but I am still not there. I mean, I have a beat up tiny suitcase that stores my derby gear but otherwise this lady is all about the backpack. After checking into the prices of a suitcase (how can they be so expensive?!) I decided on sewing up a sweet set of weekender luggage – at a quarter of the prices and heaps more fun! Enter the twee-est, but also handiest, set of travel gear ever! 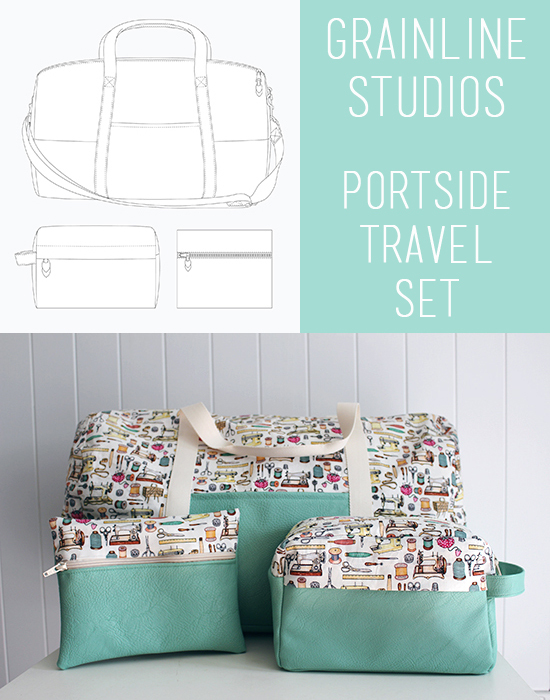 This is the Portside Travel Set by Grainline Studio. 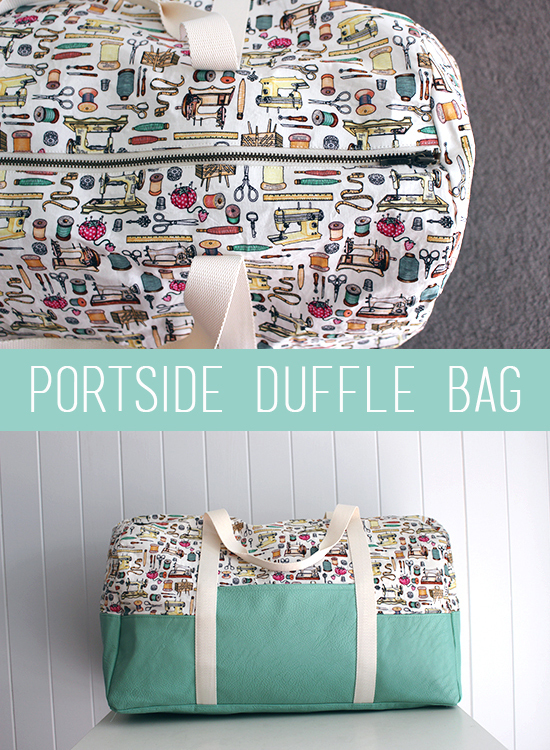 This pattern is a three for the price of one deal – duffle bag, dopp kit and travel pouch. The duffle bag features a front pocket, handles and an adjustable strap (which I left off). The dopp kit (fun history fact: the term dopp kit came into common use in WWII from their allocation to American GIs) has a sneaky front pocket and a handle at one end. The travel pouch is both tiny and quick to make – win! One thing to note – the pattern is crazy big so treat yourself to a print shop copy – no one needs to be taping that many PDF pages together! Real talk: the fabric for this one is sitting right on the cusp of twee but I couldn’t say no to it. The main fabric is an adorable quilting cotton I picked up from Spotlight last year that was originally intended for sleep shorts. The contrast fabric is the stuff of nightmares – a sweet mint green pleather that stretches like Gumby every single time you start sewing. HULK SMASH! I had lots of trouble sewing this together and even with a teflon foot and a walking foot it just kept stretching. Heck, it took 8 attempts to get the duffle bag pocket on – thank goodness for the straps hiding the damage! In the end I used a stiff bag interfacing, a walking foot, released the thread tension by one, lengthened the stitch and took my sweet and slow time. It was totally worth it in the end and there is piece of the pleather left in my stash for when I’m feeling brave enough to take it back on. The Duffle Bag is super straight forward – it’s sewing together a bunch of rectangles and hand stitching a lining in. The only problem I faced here (apart from the cursed pocket pleather!) was the fact I had misprinted my lining pieces so the fabric didn’t go together. This meant a quick recut and we were good to go. One thing to note this sucker is HUGE! It is a total weekender bag rather than an overnighter. The Dopp Kit was a little bit fiddly due to easing the curves on the top but otherwise straightforward. One thing I did notice is that the pattern piece for the top was an inch too short – this was an easy fix and may be fixed on later versions of the patterns (I grabbed this when it was first released). The dopp kit is a fabulous size for all my toiletries and I have been using it for the gym and it is all kinds of fabulous! The Travel Pouch is crazy simple to throw together and is something I have made previously for handmade Christmas gifts (chuck in a handmade lip balm and some chocolate and you win at secret santa!) The only change made here was to add a lining and then heave a huge sigh of relief when it was done because my nemesis Pleatherino would now leave me alone. Nice and straightforward. It is so lovely to just sew something up without having to worry about fit! The practicality. I finished this three weeks ago and have already used the entire set several times. The travel pouch is the perfect size for all your charges and cords! No pleather. Seriously lovely to look at but GAH! Or maybe I should amend this to only pleather if stabilised. Look at my fancy grown up compromising skills! Tabs at the end of the zips. I saw this on Mel’s version and it makes so much sense. Quilted contrast fabric for the duffle straps. This could look super cute AND be much cheaper and easier to get your hands on then webbing. It is such a pretty colour that I can forgive the pleather its stretchy sins! Gumby fabric – lol! Nicely managed! Looks totally pro from this side of my iPad! Using that pleather for another project? No way lady – send that piece to the Salvos for someone else to suffer with it. Anyway your Portside and accompanying accoutrements are tres speciale. Total love. But it is so dreamy! What are these magical ports with wheels? I must find out more STAT!!!! The puppies are too twee! (Who am I kidding, I had to look “twee” up on Google. I’m a Yankee Doodle Dandy.) And Berra? That’s Yogi Berra the baseball player to us! Lovely weather year round to y’all. (Soon to be the Embarrassed States of America with our upcoming elections.) But, education and politics aside, LOVELY MAKE!!! Who makes the fabric? I lurve it, and really don’t think it’s twee. At least to a sewer, sewist, whatist? (Heated discussion on Facebook.) I would love to hear comments by fellow travelers! And thanks for the pleather advice. It looks fabulous, but I’ll probably steer clear now. I think most pleather is pretty stable – this one was super soft and stretchy. I’m keen to try it again with lots o’ interfacing! P.S. Do you use the term “Dopp kit” in Australia? I love this set and if I saw it in a shop I would snap it up, the colours are amazing and that pleather is awesome. Thanks, Morgan! I’m really quite smitten with this set 😀 You totally need one – it’s such a fun make! And I am sticking with Q.T. because they are cutie dogs (see what I did there?!) teehee! I’d never have thought pleather would be crazy-stretchy. It’s good you worked out how to deal with it coz the combination of the two fabrics is pretty awesome. And the whole set most cool and groovy and very useful. I didn’t pleather would be stretchy either but maybe it was because it was so soft and lovely? I am hanging on to the remnant I have left for a tote bag in the future – it is so worth the pain! Oooh a tote bag in that pleather would be really yummy! 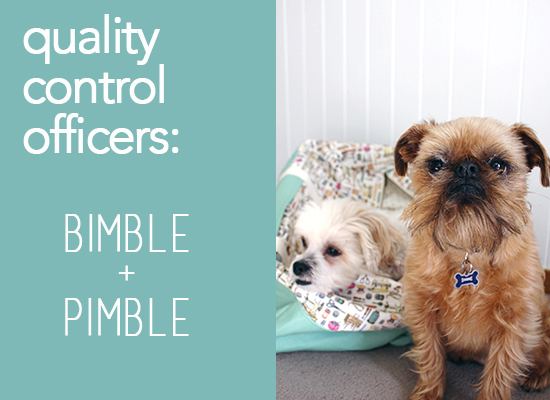 Those quality control officers are the cutest and look like they mean business! I think a weekend trip is in order to try out your new luggage. It’s the cutest! Poor Bimble is so patient but Pimble never has a bar of it! Not going to lie – it makes me feel all fancy an grown up to have matching luggage. And this pleather was a pest but so worth it in the end!